Feeling good, looking good, and doing what you love is easy when you have all of the right products. Below we shared our thoughts on products that would make you feel and look good. Whether you are sleep-deprived, in need of some re-focusing, or very stressed, these three balms can help you out. Even if your schedule is too hectic to take a fifteen minute break, try and take five and regain that focus and clear mind that helps you do your best work. 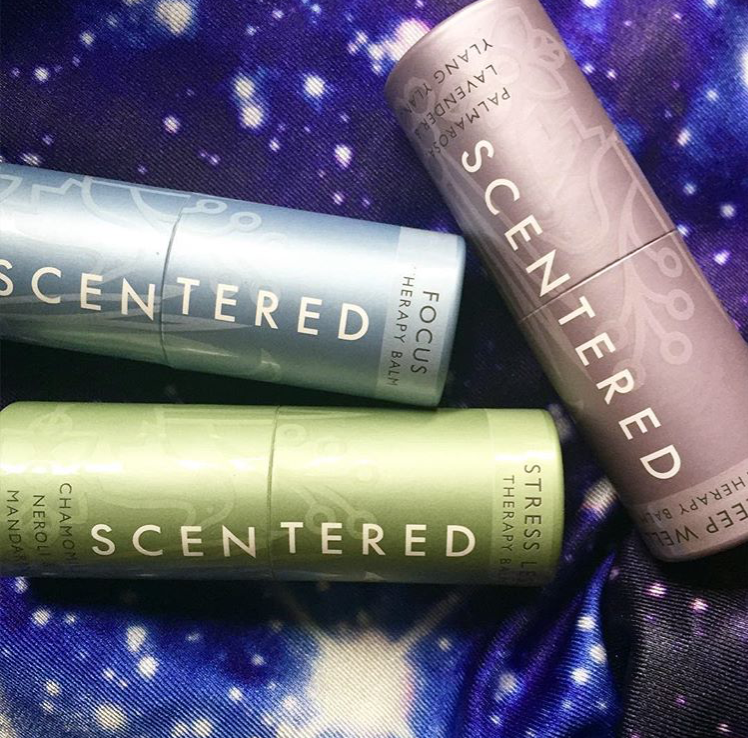 Our Experts from Mytopface tested each Therapy Balm from Scentered, and ended up feeling better than ever. After trying the Focus Therapy Balm right before an activity, as advised, we felt alert, awake, and ready to fulfill our next task. Also note to not use this balm two hours before going to bed, as it has a strong stimulating action. The scent smells clean, refreshing, minty, and leafy. Scentered describes their usage instructions as rituals. According to the rituals, you apply Focus Therapy Balm to all pulse points of the body, inhale and let it reset your mood while it takes effect. If you catch yourself not thinking straight and you want a quick and effective pick-me-up that actually works, the Focus Therapy Balm worked for us, and it can for you too. After trying the Sleep Well Therapy Balm we can best describe the scent as lavender. Making sure to use the balm in the same manner, again applying it to all pulse points, then inhaling the balm, you will then have a more restful sleep. We all wish we could just plug ourselves into a wall, like an iPhone, but unfortunately our bodies do need actual rest. Using the Sleep Well Balm will have you waking up feeling re-charged and ready for anything. You can even use your Balm before a power nap, so you can wake up feeling as if you had a full night of rest. 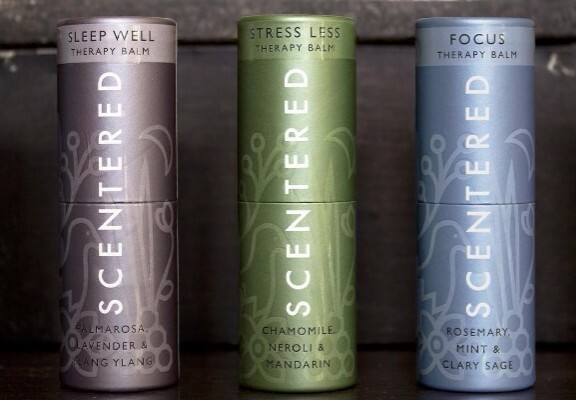 The Stress Less Therapy Balm smells more herbal than the others. The key benefits to this particular balm is that it eases tension and lifts spirits. Each balm is made up of all natural oil blends, providing as a better alternative to applying and inhaling harsh chemicals. Get your stress levels in check with this Stress Less Therapy Balm. As these balms are portable and small enough to take everywhere you go, there’s no reason as to why you can’t treat yourself everyday. These balms were designed for your pleasure. Women and men are faced with battles daily, some at a higher peak than others, so instead of juggling stress and frustration, juggle the many options that Scentered provides with their amazing Balms. 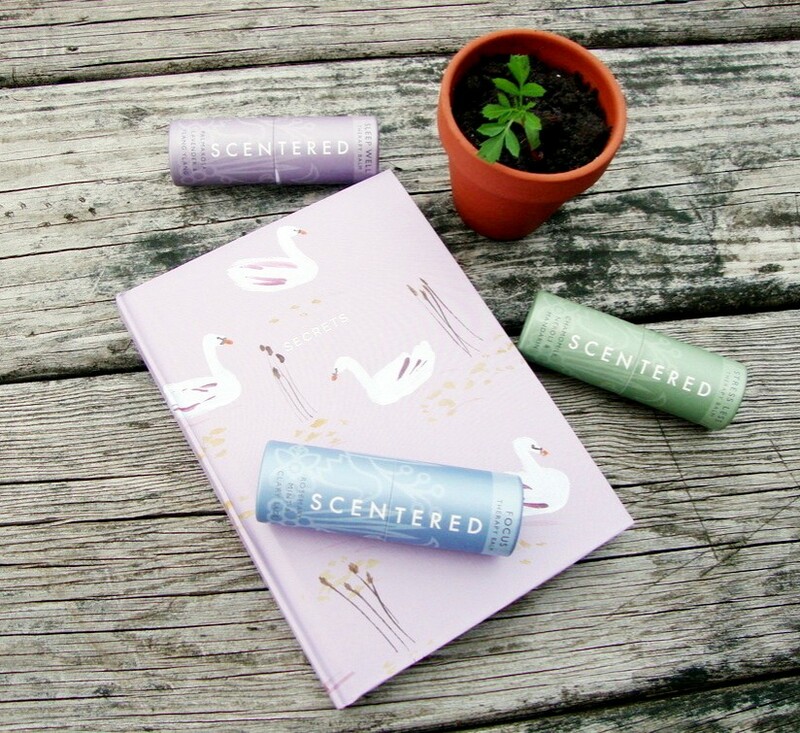 Treat yourself by taking a moment to breathe in the aroma of the ingredients, as encouraged by Scentered. 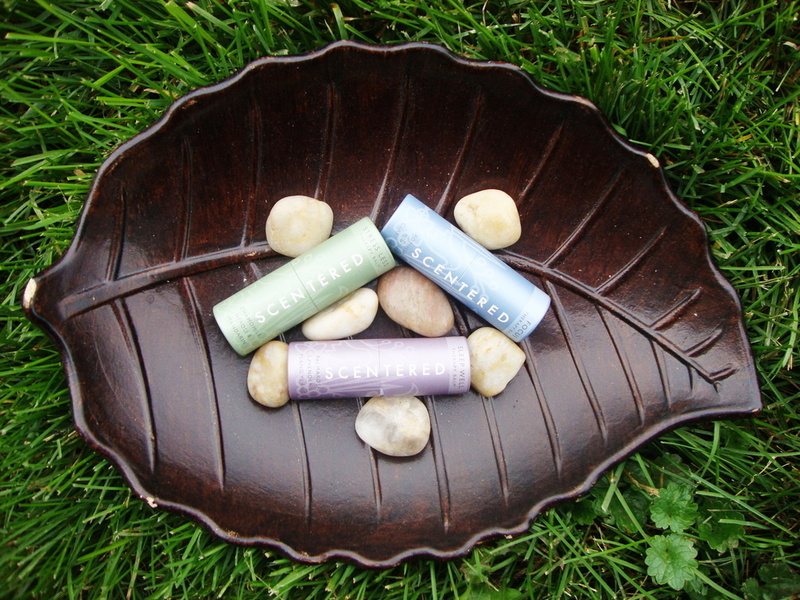 Reset any mood of your choice with these mood altering and enhancing Balms. We hope sharing our experience will help you enjoy your experience with them, too. Between getting ready for bed, trying to regain focus, or calming down your stress levels, you are going to want to make sure you are feeling comfortable in what you are wearing. Nothing beats a comfortable pair of leggings. And if you can match the assorted colors of your balms with your favorite pair of leggings, like the pair in the picture above, that’s a match made in heaven! You’ll love the feeling and look of these Galaxy Dark Blue from Leggies. If you are looking for something to do while wearing your comfortable leggings, you can jot down your favorite beauty routine or products with this amazing Joutsenlampi Notebook from Nunuco Design Company. It is conveniently small enough to fit in your pocket or purse. Whether you are at home, or hanging out with some friends, you can use this Notebook to use in any way that you see fit. Also, we would like to extend a special thank you to Nunuco for this notebook. Our Expert team was excited to try each product as they are all new and unique to us in their own way. They were all awesome to try, and if you want that awesome feeling, you can look and feel great, too, with the products mentioned above!